You may click each of the images in this story to view them at a larger size. According to the Texas Department of Transportation (TxDOT), 180,000 vehicles per day drive I-35 between US 183 and SH 71, the 10-mile central artery for travel and commerce in Austin. The Capital Area Metropolitan Planning Organization (CAMPO) estimates the city’s population will almost double over the next 20 years. Considering that 85 percent of current traffic is local, the prospect of doubling Austin’s population is daunting. 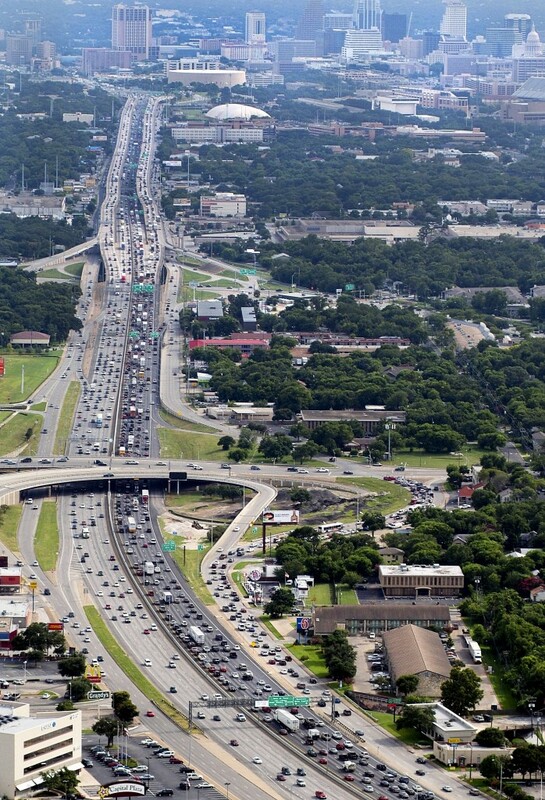 The Texas A&M Transportation Institute (TTI) conducted a recent project, Long-Term Central Texas I-35 Improvement Scenarios, to help local stakeholders in the Texas capital identify potential solutions to the looming mobility problem. Researchers looked at a larger segment of I-35, from San Marcos to Georgetown, approximately 70 miles across three counties. The study was funded as part of TTI’s Mobility Investment Priorities Project (“Rider 42”) and involved the Central Texas Working Group. TTI’s analysis of the worst-case scenario in 2035. Note the peak hours when traffic slows to a crawl. The team started with the CAMPO regional travel model—a representation of where people live, work, shop, go to school, etc. A dynamic-traffic assignment model—a relatively new tool—helped researchers achieve a more accurate portrait of projected traffic trends. TTI created a visual representation of projected traffic levels in 2035. Akin to a weather map showing thunderstorm intensity, the colors reflect how fast or slow traffic is moving at a given time of day; the bluer, the better. Red means traffic is nearly at a standstill. TTI looked at eight possible improvement scenarios, beginning with CAMPO’s existing plan (adding no I-35 capacity) and evaluating various managed-lane options on area congestion. Researchers only examined traffic performance in the study and did not consider costs or other feasibility issues — the idea was to identify ideas that might benefit from further study. One option to increase capacity would add six lanes (likely tunneled below existing infrastructure) from SH 45 North to SH 45 South with access to and from the new lanes along the way. Another, hybrid strategy combines multiple approaches that would involve drastic changes to travel behavior, including commuters working from home two days per week; 30 percent fewer students commuting to the university and 10 percent fewer people making shopping trips; travelers shifting to off-peak hours; and increasing the use of high-occupancy vehicle, transit and non-motorized modes by 25 percent each. Under these more aggressive approaches, the traffic forecast in 2035 is much brighter. The red areas are essentially gone, though a few localized bottlenecks remain. Local operational strategies could troubleshoot these (assuming implementation of the drastic behavioral changes detailed above). As a prime example of how research can inform policy discussions and actions, TTI’s results can contribute to the region’s 2040 plan development now under way, though ultimately it’s up to local agencies and policymakers to decide which options to pursue. The hybrid strategy will require significant consultation with the public, changes in travel behavior and decisions to alter the current course of development. Research into the issue will continue through TTI’s Transportation Policy Research Center. For more information, contact Jeff Shelton at (915) 532-3759 or [email protected].